I'm back again with another card, what can I say I had a productive day for once, lol! This card was a bit out of my comfort zone being a one layer card and that I used a bright coloured card stock instead of my normal white! I am putting this in a few challenges, Cas-ual Fridays - Hunger Games (at least one arrow), CAS on Sunday - one layer and Simon Says Stamp - Anything Goes. Tracy, this is so fun! Love the texty cake! Thanks for playing along with us at the Simon Says Stamp Challenge this week! 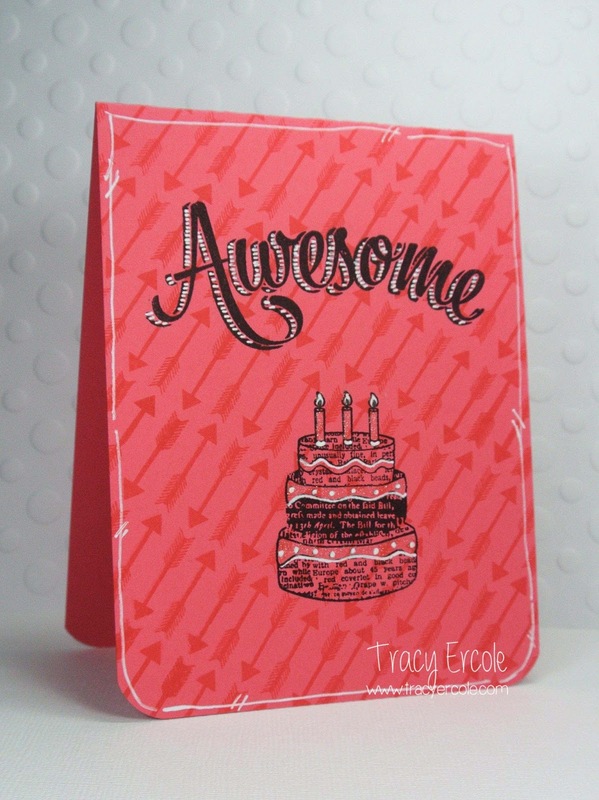 Love this card Tracy. Perfect take on the Hunger Games! Your gel pen is the perfect touch! This is gorgeous Tracy! I love the colored CS base and the scale of the sentiment. Perfect one layer design! Thanks for joining us at CAS on Sunday!! this is so cute! love the highlights you did with the white pen. sweet card! thanks so much for joining us this week at CAS-ual Fridays Challenge! WOW! Your white pen doodling is amazing! And I love that arrow background! Thanks for joining us at CAS-ual Fridays Challenge! What a SUPER FUN card! Thanks for playing along with us at CAS on Sunday! !